Sesame seeds originated in India. These seeds are considered the oldest oilseed crop in the world. In fact, sesame plants are the oldest known plant species to be grown primarily for their seeds and oils rather than for their leaves, fruit or vegetables. Although it is a seed plant, it can still bother people with allergies and has a distinctly nutty flavor. Highly valued in eastern Mediterranean and African cultures, sesame seeds are used to flavor foods, provide essential fats and enhance skin health. Sesame has one of the highest oil contents of any seed and a rich, nutty flavor, which is why sesame oil, tahini and the seeds themselves are common ingredients in cuisines across the world. 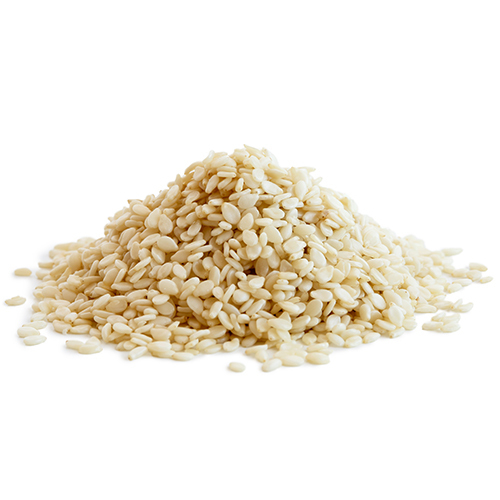 Sesame seeds add a nutty taste and a delicate, almost invisible, crunch to many Asian dishes. They are also the main ingredient in tahini (sesame seed paste) and the wonderful Middle Eastern sweet call halvah. Toasted sesame seeds are sprinkled on salads, sesame paste is added to sauces, and delightfully aromatic sesame oil is used to flavor everything from dips to marinades. While the exact circumstances surrounding sesame’s arrival in China may be lost to history, there’s no doubt that today it is a mainstay of Chinese cuisine, think sesame chicken. The seeds of the sesame plant are featured in many Asian cuisines. Both black and white sesame seeds are used in Chinese cooking. Like sesame oil, white sesame seeds have a nutty flavor, while black sesame seeds taste more bitter. Spice paste concoctions made with sesame seeds enhance Indian dishes, and sesame seeds play a role in Japanese vegetarian cooking. In China, sesame seeds are used to flavor cakes, cookies, and popular desserts such as sesame seed balls and fried custard. You’ll also find them in savory dishes. Needless to say, while Asia may be the epicenter, sesame is beloved all over the world. Sesame seeds need full sun with a well drained soil. Sow the seeds after frost has passed. Sesame plants require between 100 and 130 growing days before the seeds are ready to harvest. Seeds are ready for harvest when the pods turn brown and begin to crack open slightly. Harvesting of sesame seeds is best done by carefully plucking the seed pods off the plants. Place the pods on newspapers to dry. Once the pods are brittle and fully dried, crack them open gently to release the seeds.